Uttarakhand Polytechnic (JEEP) 2019: It is an entrance exam to get admission in various government/private polytechnic colleges of Uttarakhand state. The Exam is administrated by Uttarakhand Board of Technical Education, Roorkee (UBTER). Latest Update: Image Size Details and Specimen Released! Latest Update: JEEP 2019 Application Form Filling Procedure Started!! Last Date is 15th March. Latest Update: JEEP 2019 Advertisement and Brochure Released! This exam is also called by the name of Joint Entrance Exam Polytechnic (JEEP). The Authority of UBTER will commence the application form in the month of January. All the interested & eligible candidates can Apply Online application form for Uttarakhand or UK JEEP. The aspirants who are willing to pursue their career in engineering & non-engineering courses can check all the details related to this exam like Uttarakhand Polytechnic Entrance Exam dates, eligibility criteria, exam pattern, syllabus, counseling etc. Not only exam dates are important. It is necessary to know all the dates related to the admission process in various polytechnic colleges of Uttarakhand. Here we are providing you UK Polytechnic Important Date. These are not actual dates. We will update you after the release of official notification. UK JEEP 2019 Eligibility Criteria will be decided by the authority of UBTER. It will be different for all the polytechnic courses offered by the University. It is mandatory to satisfy all the criteria before appearing for the JEEP Entrance Exam. Candidate must have studied in Uttarakhand or have domicile of Uttarakhand. Must passed 10th or equivalent exam from Uttarakhand board or any recognized board. Must have passed 10th/equivalent exam with minimum 35% with subjects Science & Mathematics. UK JEEP Application Form will be issued by the UBTER on the official portal. It will be released in the month of January. It is compulsory to fill the form before the last submission date. Candidates who fail to submit the form before or on the last date, then they will be not considered for the exam. Visit the official portal of UBTER. Click on the given link “JEEP 2019 Online Application Portal”. Fill the form with all required details like personal information, educational qualification, etc. Submit it. It will proceed to the payment page. Pay the application fee. After payment, next step will be to upload the photo, signature & other documents. Click on Submit button to submit it. The application form will be generated in PDF format. Download it or save it for future references. UBTER Polytechnic 2019 Syllabus will be different for different courses. The syllabus includes the different topic covering the subjects like Mathematics, Science, Reasoning & Logical Discussion, Numerical Ability, General Awareness, English etc. For more detailed JEEP Syllabus, you can visit the official site. Uttarakhand JEEP Exam Pattern will be set by UBTER for each program. Candidates appearing for UK JEEP should aware about the exam pattern. It will guide the students about the mode of exam conduction, time duration, etc. The Exam will be conducted in offline mode (Pen-Paper based). There will total 100 questions with fours choices/options. Question paper level will be medium. It will be in class 10th & 12th level. No negative marking will be there. For each correct answer, 1mark will be allotted. The Admit Card will be published in the month of April through online mode. Candidates who will successfully submit the application form will get admit card. Aspirants can download their admit card from the official website. 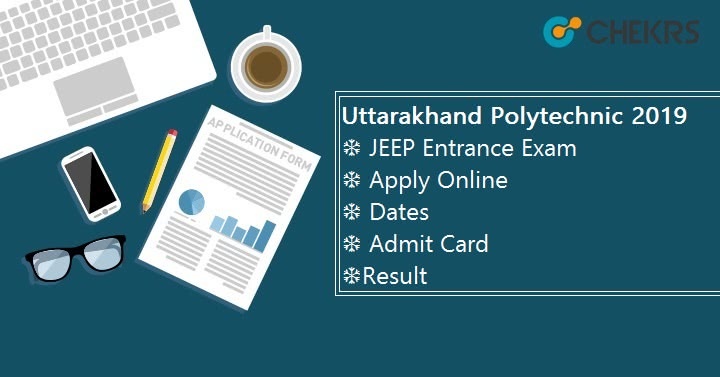 The Uttarakhand JEEP Admit Card will contain the exam time, exam date, applied course, etc It is mandatory to bring the admit card in the examination hall and at the time of counselling. Click on the link here there to download the ‘JEEP 2019 Admit Card’. Enter the required details to access the admit card and submit it. After submitting it, admit card will appear on the screen. Download or save it for future references. Following are the examination centers with center code, please check it. Uttarakhand JEEP 2019 Answer Key will be published within 4 or 5 days after conducting the exam. Candidate will get the answer key through online mode. Applicants can match their answers with the released answer key and can estimate the score. After conducting the exam successfully, UBTE will announce the UK JEEP Merit List in the month of May. The result will be available in online mode. Candidates can check the result by entering their Roll Number. On the basis of score obtained in the JEEP Entrance Exam, merit list will be declared after the result announcement. Go to the portal of Uttarakhand Board of Technical Education, Roorkee. Click on the link “Download JEEP 2019 Rank Card”. Enter JEEP-2019 Roll Number & Date of Birth, and then click on the show button. Rank Card will appear on the screen with all details like name, roll number, category rank, etc. Uttarakhand Polytechnic Merit List will be declared after result announcement. It will contain the name of qualified students. Merit List will be prepared by UBTE, Roorkee. Counselling will be followed by the declaration of Merit List & Cutoff. Cutoff will be minimum score obtained by the appeared candidates to get selected for admission in various Polytechnic colleges. UK JEEP 2019 Cutoff will be prepared by the UBTE board authority. It will be based on various factors like a number of appeared candidates, the number of qualified students, the difficulty level of paper, etc. Candidates who qualified the JEEP 2019 exam will be called for UK Polytechnic Counselling Procedure 2019. Students can appear for the counselling as per their rank in the exam. To take part in counselling, students have to register through online mode. Candidates have to fill their choice of colleges & courses. On the basis of their choice & rank, the seat will allotted. Candidates have to bring the original documents for verification at the time of reporting.